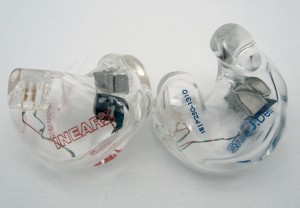 EarSonics SM64 universal IEM: The P250 is more forward, dynamic, and effortless, yet in-the head sound in comparison with the more spacious and relaxed SM64. Presentation widths are similar while the SM64 has superior presentation depth, slightly better imaging, and performs better with lower-end sources due to better instrument separation. The SM64 is more coherent and transparent while the P250 has better clarity, is more dynamic, and has more instrument detail. The SM64 has a smoother note that is more forgiving tracks that have less than good mastering. Bass emphasis is higher and the ability to sustain deep bass notes is greater from the SM64. While the SM64 notes are smoother and thicker, the P250 has a boost in the mid-bass frequency response resulting in a bit more warmth which gives the SM64 a better feeling of integration from the bass through the midrange. The more forward P250 offers better clarity and instrument detail while the SM64 puts the overall presentation into better focus while pushing the midrange a bit forward in relation to the rest of the spectrum resulting in a mid-centric presentation. The P250 is brighter with faster treble notes in comparison to the relatively laid-back, smoother, and less defined SM64 presentation. 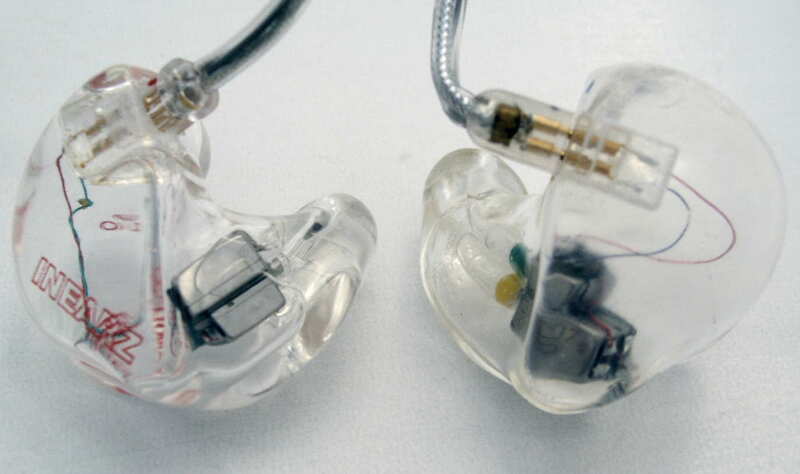 Due to the differences in sound signatures, fit type, and price, the EarSonics SM64 and InEarz IE-P250 are not true competitors. The smoother notes, further presentation perspective, stage style frequency response, and mid-centric sound, SM64 offers a relaxed, organic, and euphoric sound in comparison with the P250’s slightly V-shaped yet forward presentation that gives a more immediate, detailed, and forward presentation. Choosing between the two will be dependent on the sound signature and price point as the P250 will please those that are used to consumer sound and want more instrument detail while the SM64 is better for stage use and those that like to relax and listen to the overall presentation. ProGuard P2+1: The P250 has a V-shaped sound in comparison with the mid-centric, more spacious, and open sounding P2+1. While the P2+1 has a larger overall presentation width and depth, the P250 proportion is more true-to-life. The P250 presents more detail that is easier to hear while the P2+1 paints a better picture of the overall performance, with higher instrument separation and overall resolution. The P2+1 is more transparent and coherent, but the P250 is more dynamic. The P2+1 is more forgiving of poor masters and low bitrates in large part due to the more relaxed treble. Bass of the P250 is more enhanced, forward, and immediate with better sustainment capability in comparison with the warmer and thicker P2+1 that displays better control and texturing. The midranges have similar projection, but the different proportions and more mid-centric presentation of the P2+1 gives vocals precedence compared with the P250’s immediate feel. The P2+1 is a bit more forward in the upper midrange which makes female vocals more prominent, while the P250 has a brighter treble region, but the notes aren’t as smooth as the P2+1. The slight V-shape of the P250 gives a much more consumer-friendly sound signature with better articulation of detail in comparison with the mid-centric yet spacious and transparent sound of the P2+1, which was tuned for stage use. The P2+1 is ideal for the stage while the P250 will please more audio enthusiasts looking for an upgrade. Custom Art Music One: The P250 has a lighter and brighter sound that is more forward and immediate compared with the warmer and smoother Music One. Spatially, the P250 develops a larger soundstage, especially in width, but the Music One depth of presentation is greater giving a more 3D experience. Detail levels are higher from the P250, and individual instruments and nuances have better articulation and resolution due to the quicker note attack. The Music One is more transparent with a more linear frequency response for a sound that disappears more than the my punchy and dynamic P250. The smoother Music One is more forgiving. Bass quantity and quality of the warmer Music One varies quite a bit with the source while the P250 is much more consistent and ultimately more capable with better depth, sustainment, and control. The midrange of the more revealing P250 is clearer and cleaner due to the note presentation while the smoother Music One is easier to listen to for extended sessions. The more pronounced upper midrange of the P250 gives a brighter tonality to vocals, especially female vocals while male vocals are a bit more natural with the Music One. In the treble region, the Music One is relaxed with a slightly more natural note decay in comparison with the more aggressive P250. With a more aggressive, detailed, punchy, and capable presentation, the slightly V-shaped P250 is more consumer-oriented in comparison with the smoother Music One that gets out of the way of the music and does a better job of disappearing for a more musical experience overall. The Music One fits those that prefer organic, tube amp style sound while the P250 will reveal more and give a better picture into what is going on in the track, good or bad. Alclair Reference: The warmer Reference has a more distant presentation perspective that is presents more spacious compared with the brighter, more up-front, and punchy P250. Depth of presentation from the Reference is superior along with a slight width and imaging advantage resulting in better recreation of spatial queues within the soundstage. Clarity is close between the two while the P250 edges out the Reference in instrument detail. Performance differences are close in most other ways, but the Reference has a slight advantage across the board. Bass is more powerful and prominent from the warmer Reference while the midrange performance is similar in quality other than the spatial advantage of the Reference. The upper midrange and treble have more energy from the P250 while overall note quality is slightly superior from the Reference. While the performance between these two is close, the price difference does seem justified, but the difference in sound signature precludes this being a one or the other situation. The presentation of the Reference is more laid-back and spacious with better imaging and an overall more 3D sound while the P250’s higher detail level, better punch, and brighter sound give something different all together. 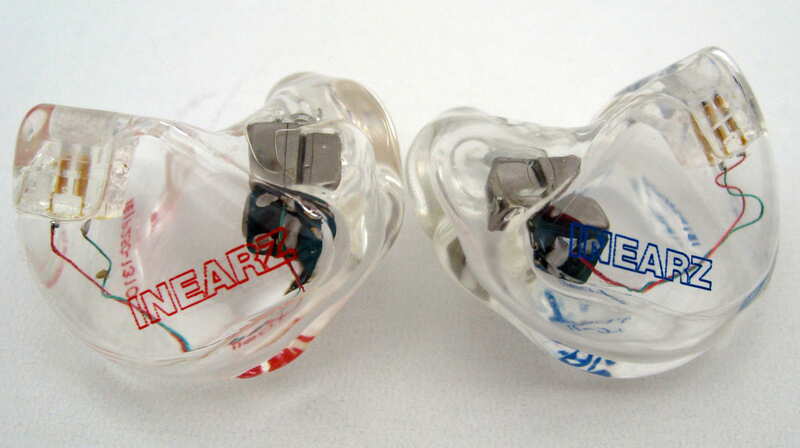 Perfect Seal Sportbud Silver: Both use the Sonion AcuPass drivers and as a result have similar performance but with slightly different sound signatures. The Sportbud Silver (SS) is a bit more forward in the presentation, but has more presentation depth vs. the slightly wider P250. Focus within the sound signature is slightly better from the SS but the P250 has better instrument separation, which shows up as a cleaner sound within the midrange. While note characteristics are quite similar, the SS has a slightly longer decay. Bass is more prominent from the workout tuned SS while quality is ever so slightly better from the warmer P250. Clarity within the midrange is a tossup depending on the track due to the differing strengths in performance characteristics. The upper midrange of the SS is more prominent while the P250 is brighter overall, with similar treble quality. Detail levels are about on par, as is transparency and coherence. With striking similarities in performance, the difference comes down to sound signature, options, and price. The P250 offers a more V-shaped sound signature, but ultimately is more neutral in the bass region while the Sportbud Silver is warmer, with more bass emphasis and a more 3D presentation. The SS is cheaper and comes with a canal only option, including the soft canal, so unless you want the brighter, slightly more laid-back sound of the P250, the SS is a more affordable option. Minerva Mi-Artist Pro: Both the Mi-Artist Pro and IE-P250 use the Sonion AcuPass driver, but the Artist-Pro is priced significantly higher. From a frequency response standpoint, the Artist Pro is more neutral, but still has a slight V-shape, with similar bass quality between the two, but the P250 extends deeper and sustains notes longer in the bass region. The P250 has superior clarity and imaging to go along with more detailed. The Artist Pro is punchier with a faster average attack and transparency is similar. While the overall presentation space is similar in width, the P250 presents with a closer perspective while also having more depth to the presentation. Treble quantity is quite similar, but the Artist Pro treble is much more refined giving it an advantage with lower quality tracks as well as making the sound overall more musical. While the Mi-Artist Pro has some advantages over the P250 in overall musicality, the P250 outperforms the Artist Pro in many aspects, making the price difference difficult to justify. Unless you need the refined upper end that results in more musicality, the P250 appears to be the easy choice between these two. Minerva Mi-Performer Pro: The Mi-Performer Pro (PP) also uses the Sonion AcuPass driver but offers a significantly different sound signature, tuned for use on stage with a more mid-centric presentation and bass reverberation that stands out. Bass quantity and capability of the PP is higher, but the bass emphasis is due to a much longer average note sustainment and slower release and decay. The mid-centric midrange of the PP, while not brought as close to you as the P250, is pulled forward in comparison to the bass and treble making the P250 sound mid-recessed in comparison. The midrange and treble of the PP are smoother yet have a similar detail level while presenting more resolution overall due to better imaging, instrument separation, and presentation depth. The P250 has more punch and has a slight clarity advantage from a faster note attack, but the PP is more transparent and coherent. Despite the fairly significant price difference, especially considering they use the same driver, the Mi-Performer Pro has a “stage” sound that accentuates the midrange, has a more powerful bass region and relaxed treble with a better overall presentation space. The P250 is more immediate, up-front, articulated, and typical of what the general public likes and has come to expect. The P250 is a standout at the price point while the PP has some stiff competition in the “stage” sound arena at the higher price point. Perfect Seal Fusion 11: The P250 presents with a much more up-front perspective in comparison with the Fusion 11, which images better within a larger, more 3D space and brings the presentation into better focus. The extra space results in better instrument separation for the Fusion 11 and the better proportions result in an overall cleaner sound. While frequency response is somewhat similar, the Fusion 11 (with the yellow filters) has plenty more bass presence and capability while sounding more natural in general. Warmth is similar, but the notes of the Fusion 11 have a faster overall response resulting in a clearer presentation. Other than note and presentation differences, the Fusion 11 has a more natural tone in the presence area (upper midrange), which makes the P250 sound thick in comparison to the airy Fusion 11. Treble notes of the Fusion 11 are smoother with a more natural decay and more accurate leading edge. The P250 presents details more readily, but due to the better note capability of the Fusion 11 and the superior imaging, the Fusion 11 is more detailed overall with better resolution within the soundstage. While the P250 stands its ground with other $500 and below CIEMs, the Fusion 11 is an outlier that readily outperforms the P250. The IE-P250 doesn’t sound bad from what I consider entry-level players such as phones and low-cost stand-alone players, but the performance does increase with better amps and to an extent, better DACs. Spatial improvements of better source gear reap benefits in clarity and overall special qualities. The combination of the iPhone 5 and Neco V2 amp warrant mention as the performance of this combo was excellent given the price. Overall, headphone amplifier quality has a much bigger impact than DAC quality, but combining a very good DAC and amp, such as the DX100, will reap benefits. 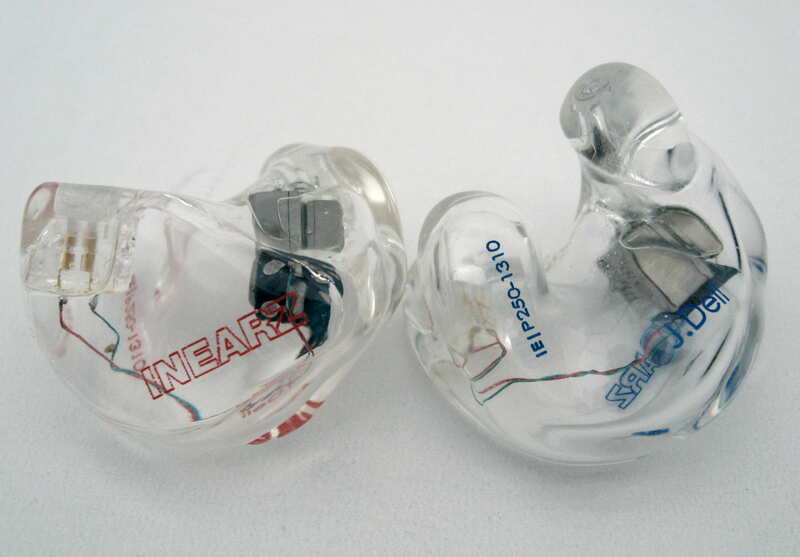 InEarz has used their experience to create the impressive IE-P250 custom in-ear monitors in their “pro” lineup. 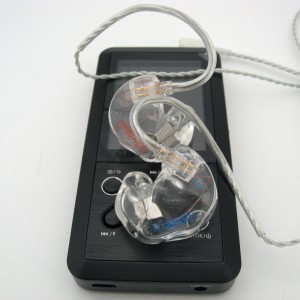 The sound signature is tailored to mainstream music fans and will give a noticeable improvement over $100 to $200 earphones, providing a high level of detail and clarity while still performing well in the bass department. When paired with a decent source, the P250 will provide a nice depth of presentation that is uncommon at lower price points. Those stepping up to the P250 will most likely be extremely happy; however there is still room for improvement with better clarity and performance with complex music. The forward presentation hides the slightly V-shaped sound signature, which lends to the mainstream appeal, and the combined punch make for an exciting sound. Overall, the P250 offers excellent performance at a relatively low cost for a customized in-ear monitor.